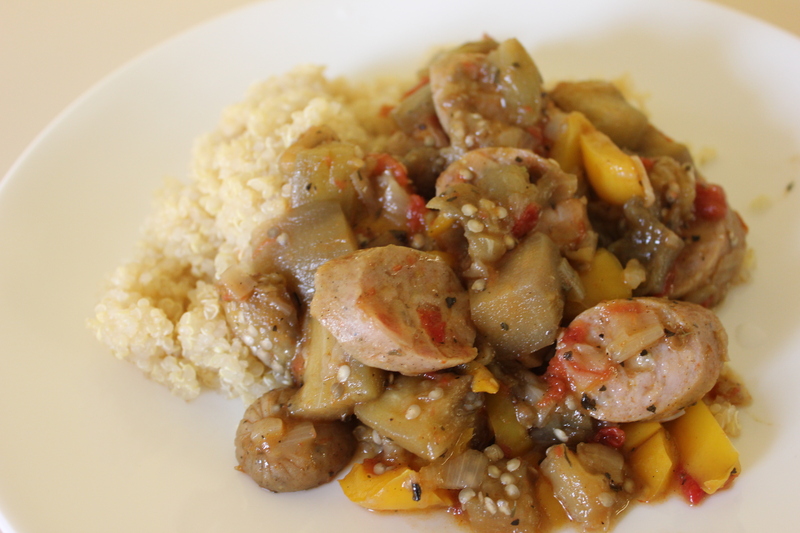 Sausage, eggplant, tomato and pepper go beautifully together for this easy summer stew! After a 10-day vacation I am back at school for several weeks to work on a research project. Whatever kitchen limitations I had last year seem like nothing in comparison to my summer set up. While I was at home I took advantage of having a grown-up kitchen, even going on a few crazy cooking escapades, but now It’s back to the usual minimalist kitchen. I only have two small pots and my cast iron skillet (yes, the beloved cast iron 5 quart pot is in storage! ), which today I realized I don’t even have a lid for. Despite all that, I am still determined to cook up a storm this summer. 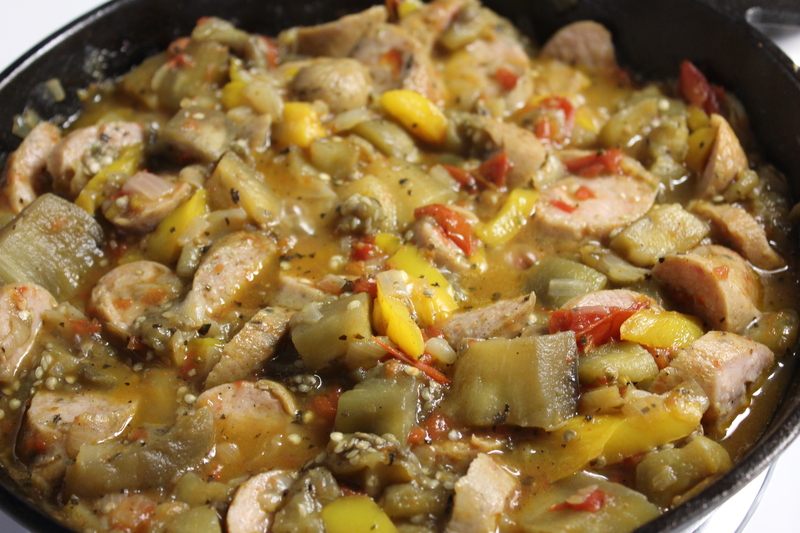 Since the weather is finally getting warm and the days are longer than ever, I decided to give in to my usual summer craving of tomato and eggplant which come together so nicely in this sauce. I got Sweet Italian Sausage from Trader Joes that was already fully cooked. 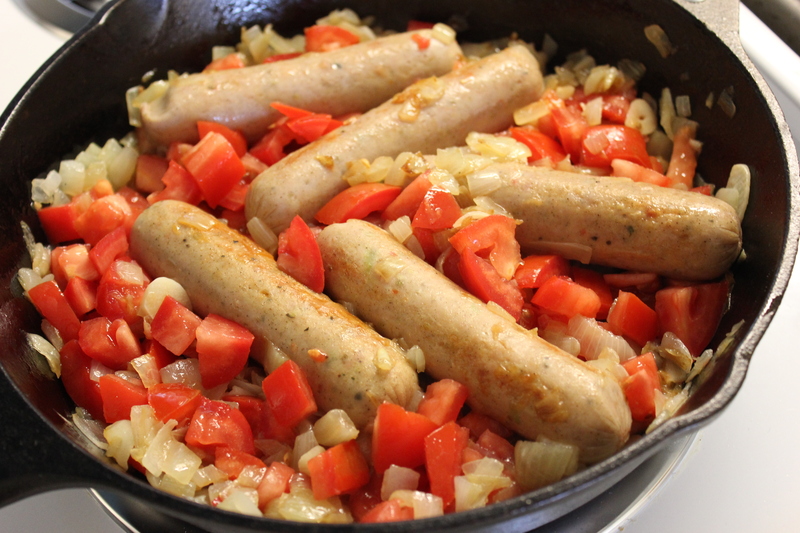 You can do any kind of sausage you like, though note that most do not come fully cooked – in this case follow usual precautions for dealing with raw meat. 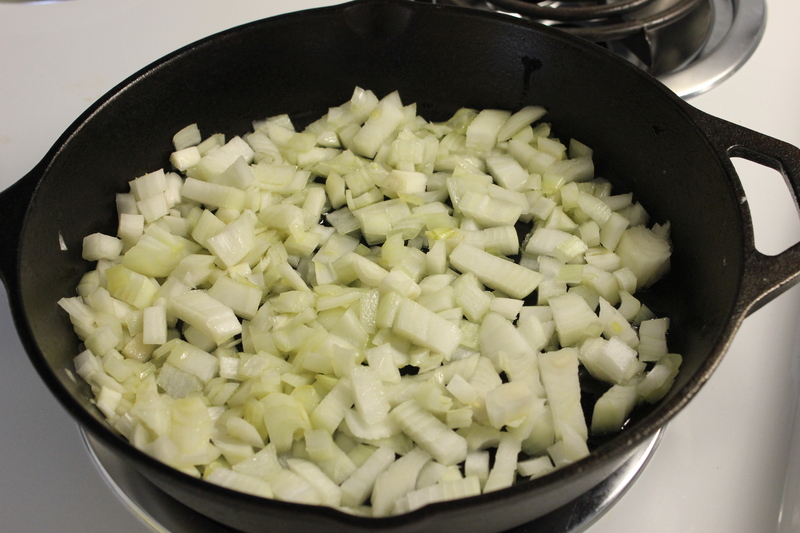 In your large pot or fry pan add the olive oil and bring to medium low heat. 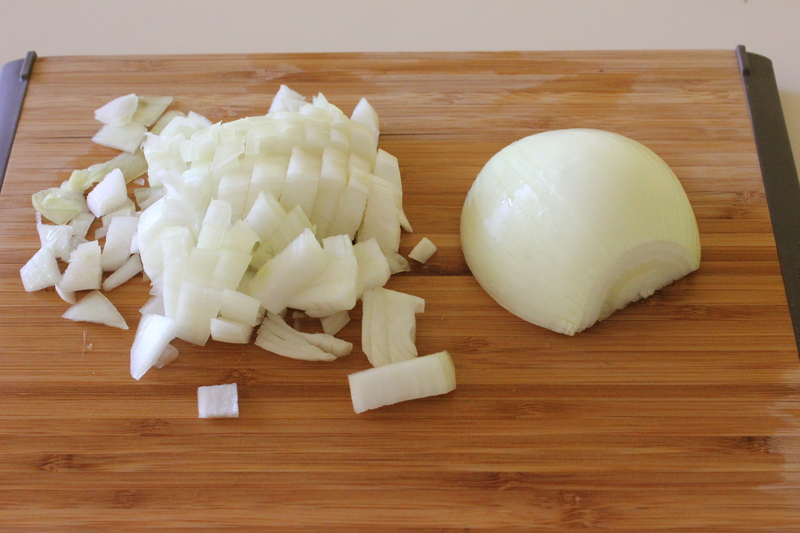 Dice your onion and add to the pan. 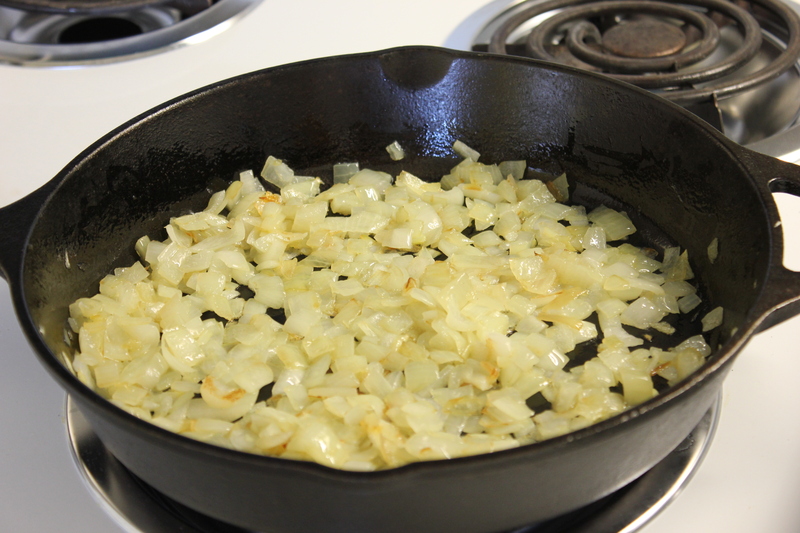 Mix often so that onions turn to a light brown but do not burn. While the onions are cooking, wash and peel your eggplant. 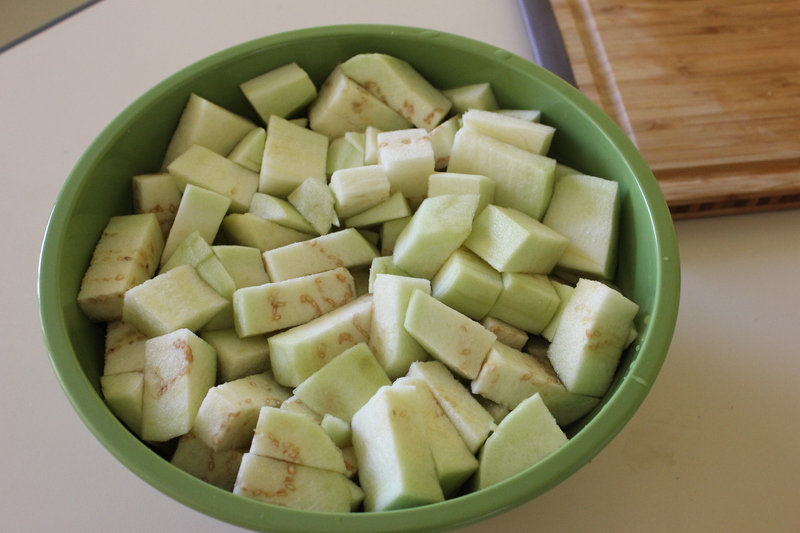 Cut into 1 inch cubes (the size of a quarter) and place into a bowl with some water and salt. Make sure that the eggplants are fully covered in water, you want to soak them to remove the bitterness. 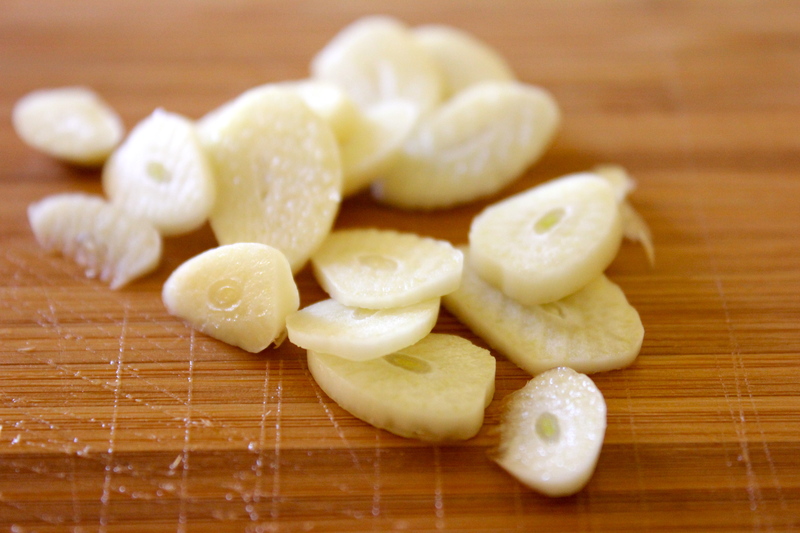 Then, peel your garlic and cut into thin rounds. 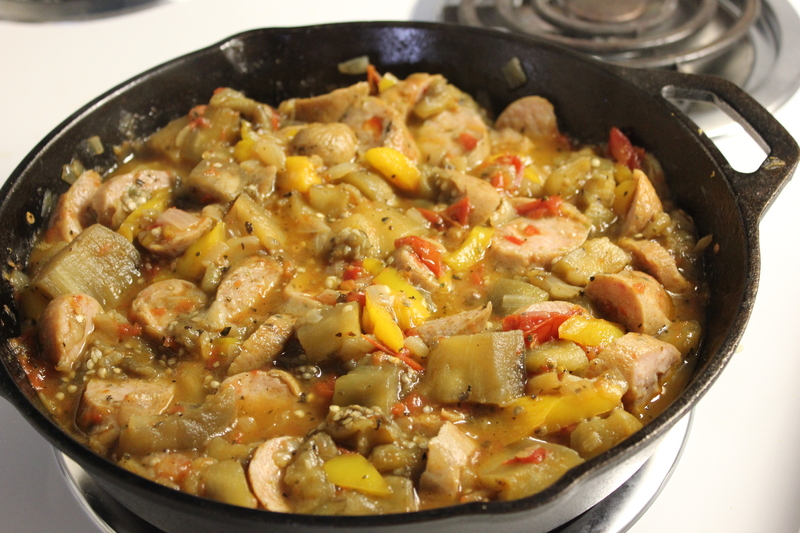 Once onions are cooked, push onions to the edges of the pan and then add both the sausage and garlic. 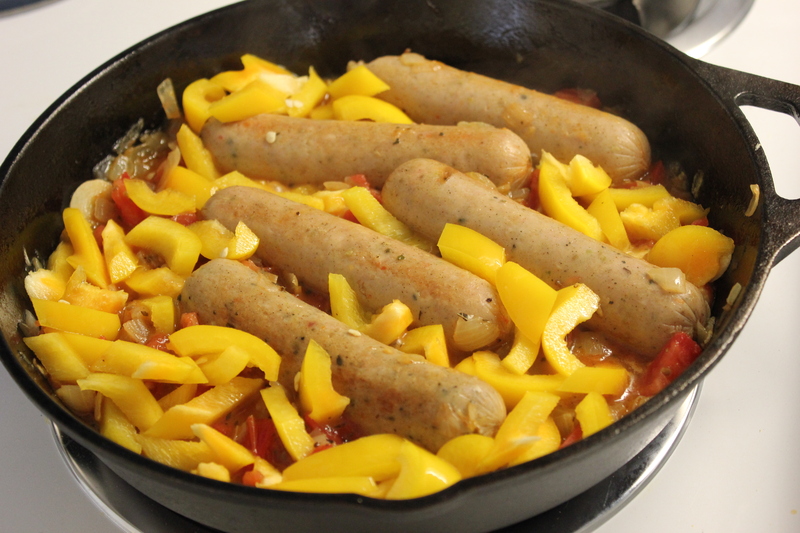 Let the sausages cook until they are browned on all sides. 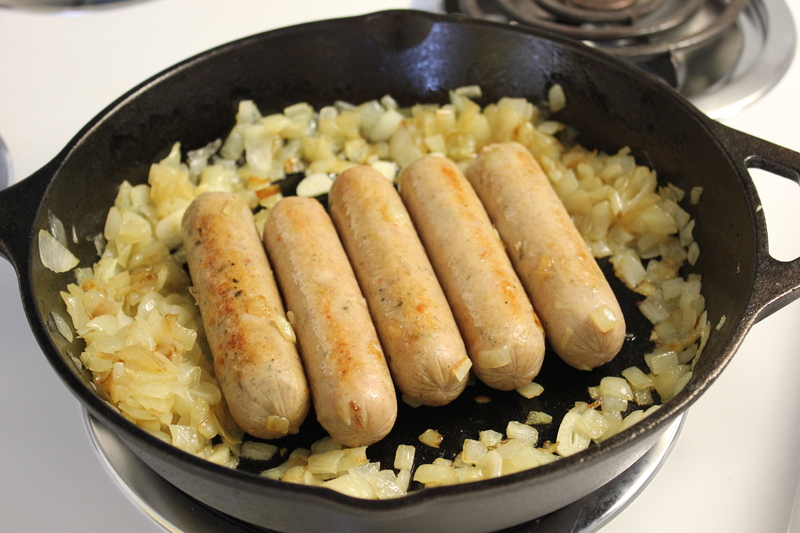 If your sausages do not come fully cooked they may give off a lot of fat which you can drain if you like. 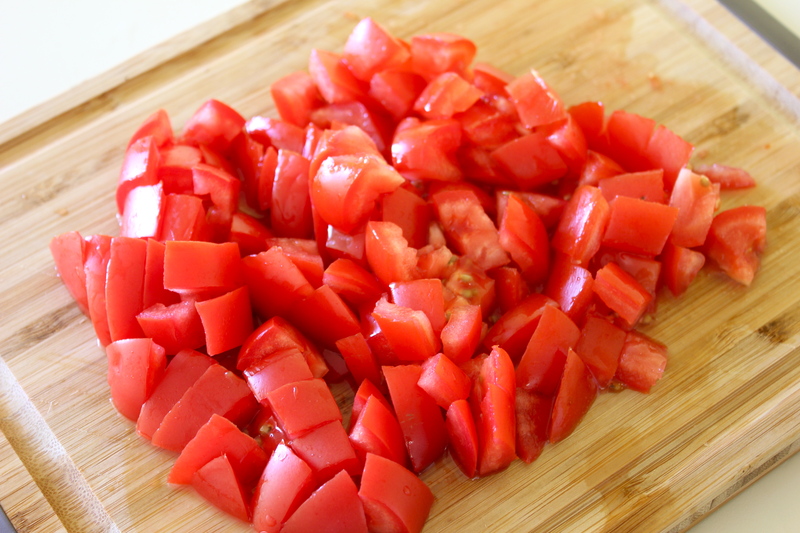 Wash and dice your tomatoes. Add to the pot once the sausages are gently browned on all sides. 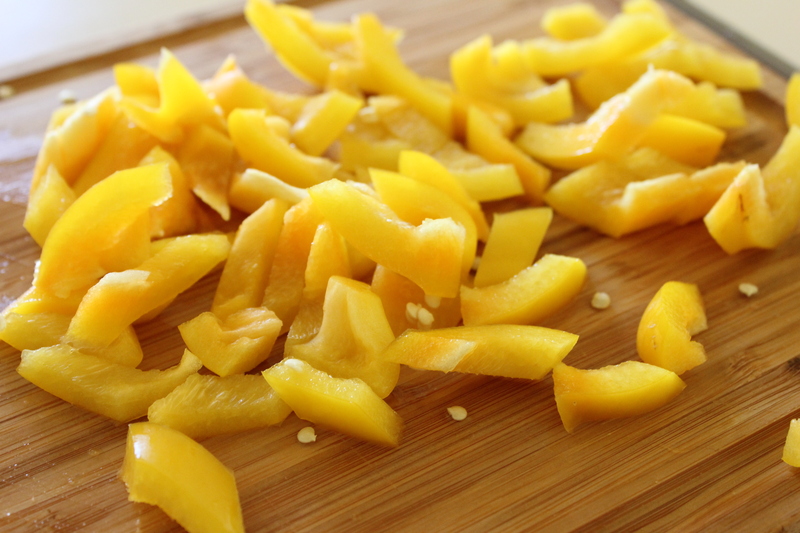 Then, wash and chop your pepper into once inch strips. Add to the sauce. I also added about a half a cup of water because I didn’t want the sauce to get too dry and burn on the bottom (note that I don’t have a pot lid so lots of the liquid evaporated). I suggest keeping an eye on the sauce and adding water as needed. Add your spices and give everything a good mix. 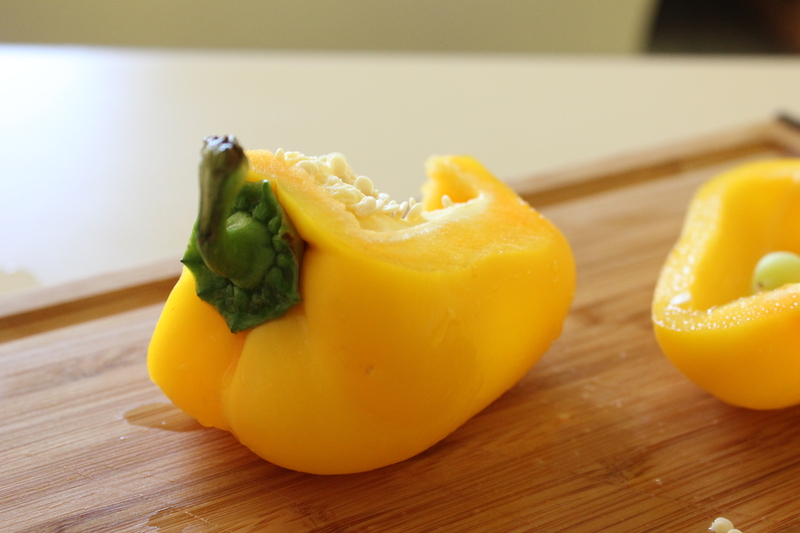 Let cook for about 10-15 minutes or until peppers are soft. 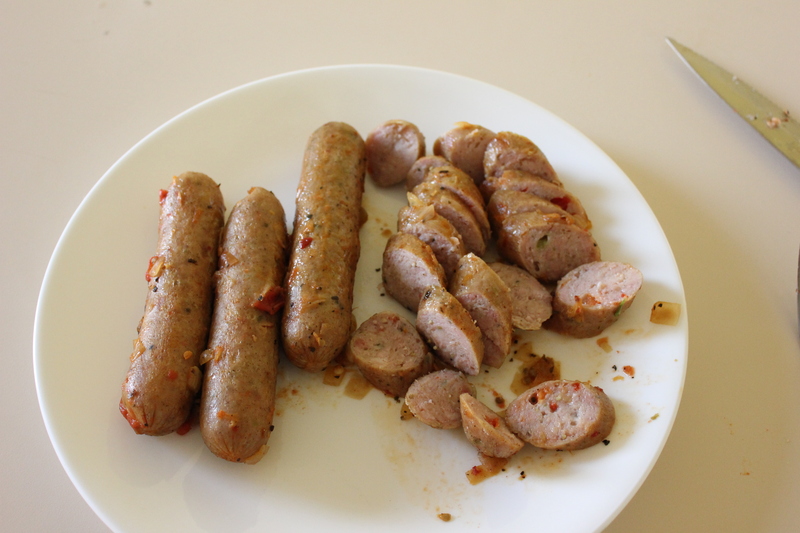 Then, take out the sausage and place on a plate. 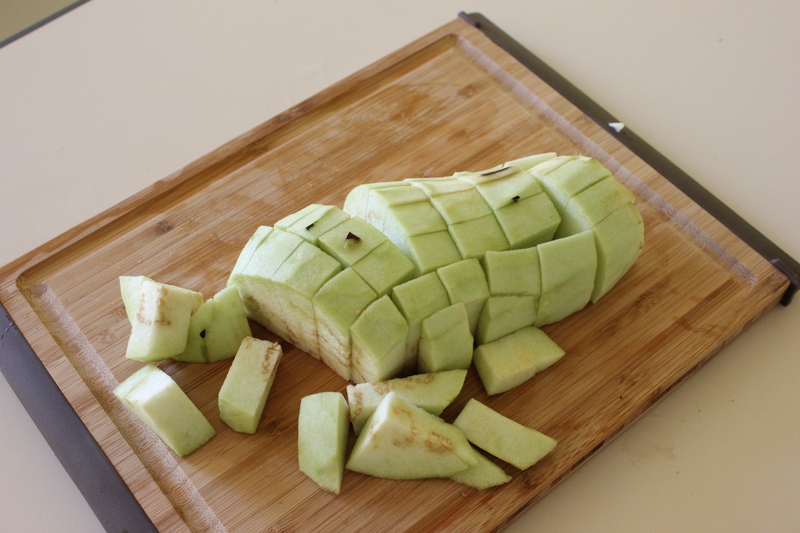 Drain and add the eggplant (when you drain the water it will be brown). 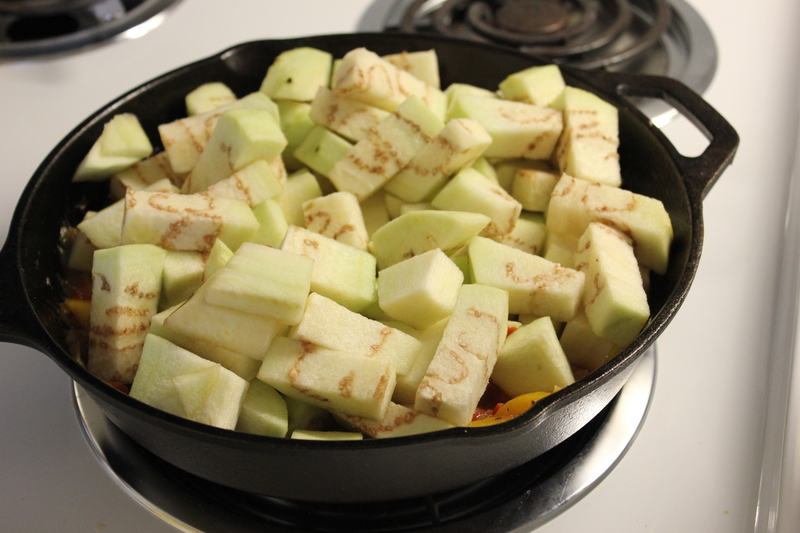 Don’t worry if it seems like a lot of eggplant, it will cook down substantially. 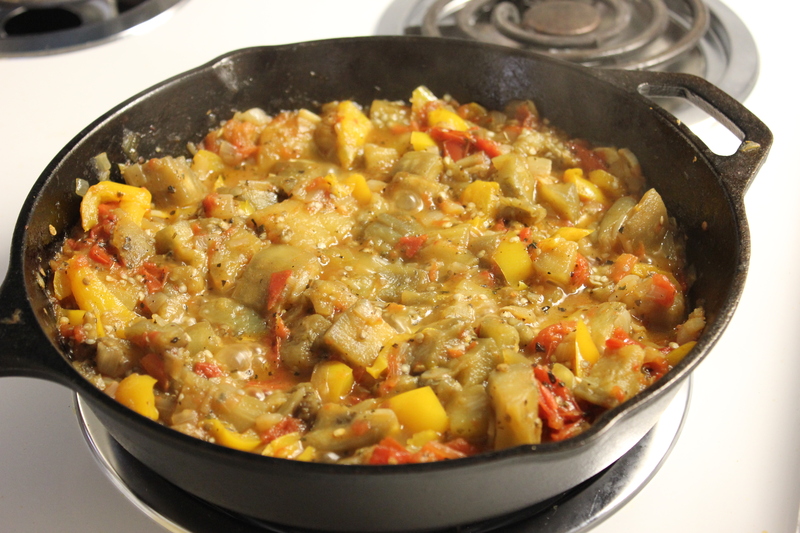 Keep mixing and pushing the eggplant down into the sauce. 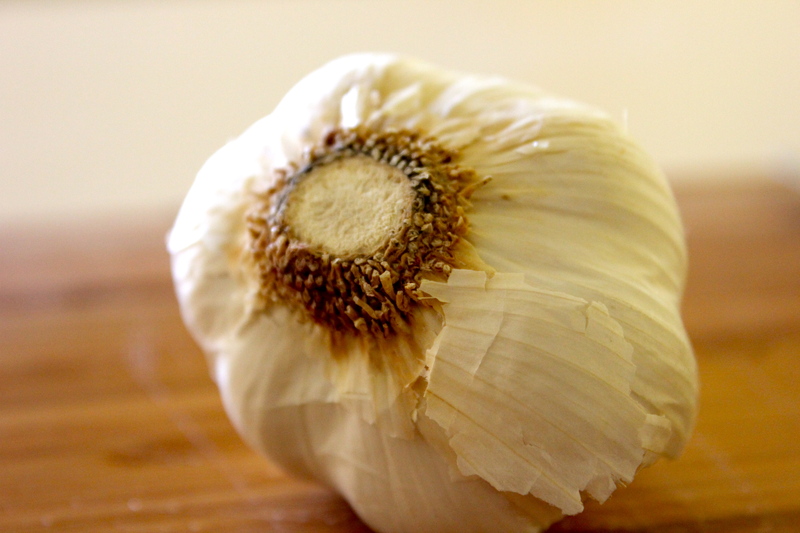 Let cook for 10-15 minutes or until brown and soft. 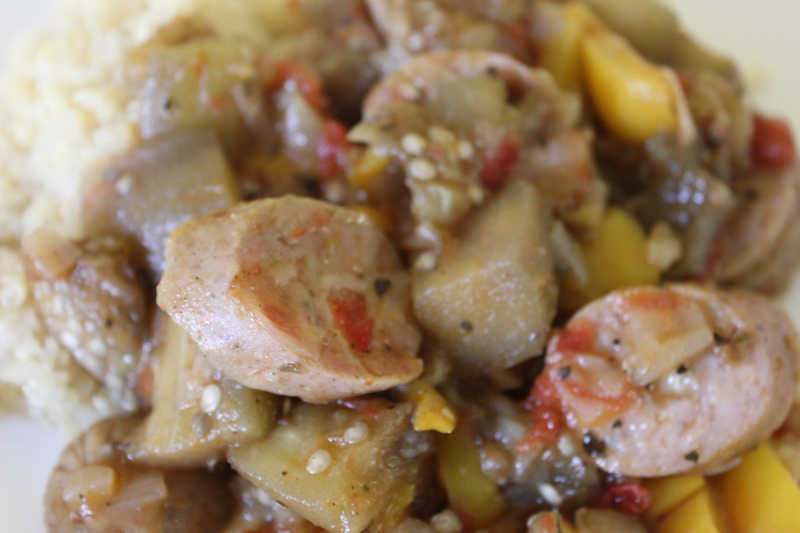 Once eggplant are cooked, slice sausage and add back to the sauce. Give everything a good mix and let simmer until heated through. I had mine with a side of quinoa (my first time having it!) but you could also have brown rice, white rice, pasta or any other side you prefer!